Frequently asked questions our customers ask alot are concerns about the timeliness and cost associated with shipment. Q. Do you offer expedited delivery? A. 24Hour Caskets is dedicated to getting our customers their orders as quickly as possible. We have a network of showrooms & storage facilities that allows us to offer next day service for almost all orders. For some orders, we may be able to accommodate same day or weekend service – please review our Shipping Page to learn more. Q. 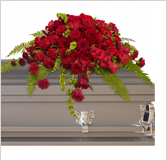 How is 24Hour Caskets able to get caskets shipped all over the United States so quickly? A. We have showrooms & storage facilities located all across the country, in over a dozen major cities. The casket you order is no more than a few hours from you… guaranteed! Q. How are your caskets shipped? A. Expedited service usually requires air transport, via a major airline, with a courier service hired for transport from the airport to the funeral home. 24Hour Caskets can coordinate delivery details with the funeral home, saving you the worry of having to arrange details. Ground delivery is accomplished by one of several trucking companies that we work with – we can deliver to any location you desire. Q. I understand that you offer outstanding prices for caskets, but is the quality just as exceptional? A. Yes. We have embraced a balance that allows us to deliver incredible, high-quality caskets at the lowest prices available. We have models in 18-gauge steel, hardwood, and veneer. Interiors are rendered in high-quality fabric. The designs are sturdy, tasteful, and dignified. We are quite proud of our products, and our customers are enthusiastic in their support. Q. For air transport, can I transport the casket from the airport myself? A. Yes, and this is a common option for customers looking to save on the additional expense of a courier. You will need to have a suitable vehicle (cargo van or pickup truck with cargo restraints). Contact us to coordinate pickup arrangements. A. At 24Hour Caskets, for your convenience we offer you a wide range of payment options – we accept all major credit cards, debit cards, bank wire, personal checks, money orders, or online payment via PayPal. Please review our Payment Information Page to learn more. Q. Do items include a charge for sales tax or any other fees? A. Probably not. Texas is the only state that requires us to charge sales tax – if you order from anywhere else you will pay no sales tax or additional fees, which could potentially save you hundreds of dollars on your casket purchase. Q. Once I have ordered a casket, do I have an opportunity to change my mind? A. You can review & change your casket order right up until shipping confirmation. After that point, cancellations are subject to a 30% restocking fee plus the costs of shipping. Q. What kinds of details will I have to oversee once I submit my order? A. We know that you have a lot on your mind, so we do our best to ensure that you do not have to worry about the details of your order. We will arrange all the details of transport, both air and ground. We’ll get your order to your funeral home on-time, every time. 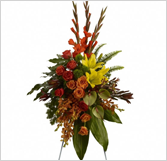 We will also coordinate delivery with the funeral home – there is no need for you to be there. We will handle all the work so you can concentrate on other things. Q. I have heard the term ‘GPL’ mentioned in connection with funeral purchases… what is a GPL and why is it important? A. A GPL is a ‘General Price List’. This is one of the most important parts of the Funeral Rule that has been established to regulate funeral sales by the United States Federal Trade Commission. The GPL is an itemized list of costs that every funeral home must provide to customers. It must also include disclosures about what charges are mandated for legal purposes. These lists allow customers to compare prices for funeral goods & services from one provider to the next, as well as have a definite accounting of all costs. It is also a helpful guide for customers to determine which goods & services they want. Please review our Funeral Rule page to learn more. Q. 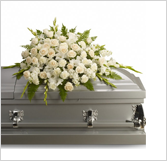 Will the funeral home allow me to purchase a casket from an outside retailer? A. Yes. One of the Funeral Rules, codified within the Clayton Act, is that a funeral home cannot refuse to use any of your funeral products that were purchased elsewhere. The casket that you purchase from 24 Hour Caskets, or anywhere else, can be used at any funeral home. Q. Regarding the construction of your caskets – what is the difference in thickness between 18-gauge steel and 20-gauge steel? A. 18-gauge steel can be visualized as the thickness of the exterior metal in your car – the hood, doors, or roof. 20-gauge steel is thinner, about the same thickness as a saw blade. Q. How large is a typical casket? A. The exterior measurements of the most common size for a casket are about 24? deep, 27-1/2? to 30-1/2? wide, and 81? in length. Q. Does Express Casket sell vaults? A. Currently we do not sell burial vaults, but we are constantly expanding our line of products – we may offer vaults in the future. Q. If there are any problems with my order, when are you available to contact? A. Our customer service department is on duty 24-hours a day. If you need any assistance, please contact us via email at support@24hourcaskets.com, or call 866-474-5051, and we will work to resolve your issue as soon as possible.